Meek Mill Rings In NBA Playoff Game After Pennsylvania Court Orders Release : The Record The Philadelphia rapper's imprisonment over probation violation had been a lightning rod in a debate over race and the nation's judicial and correctional systems. 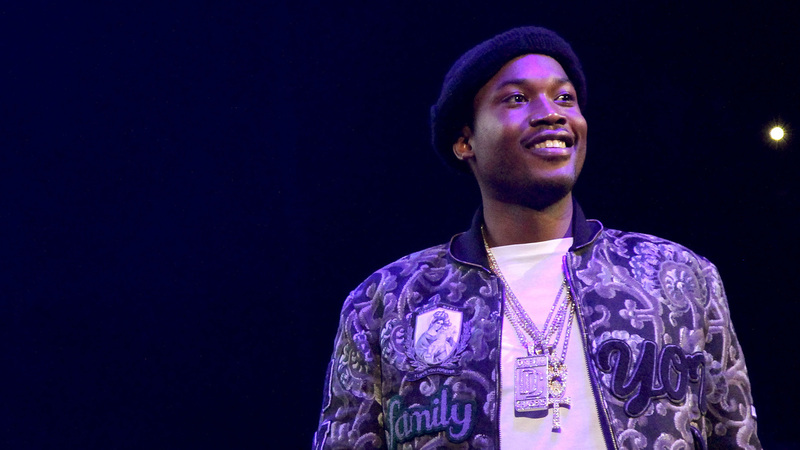 Meek Mill performs during 105.1's Powerhouse 2015 in October 2015 in Brooklyn, NY. Meek made his first public appearance after being released on bail as the special guest of Philadelphia 76ers co-owner Michael Rubin at Game 5 of the NBA Playoffs. Meek rang the 76ers customary bell to start the game between the Philadelphia 76ers and the Miami Heat. Meek Mill is being released from state prison on bail after a nearly six-month legal battle over the Philadelphia rapper being sentenced to serve two-to-four years behind bars in November of last year for violating his parole. The Supreme Court of Pennsylvania ruled today that Mill, née Robert Williams, be released on bail because of questions raised by the Philadelphia District Attorney's Office regarding the credibility of Reginald Graham, the police officer who arrested Mill in 2007. During a hearing last Monday, prosecutors overseeing Mill's case recommended granting the rapper a new trial based on what they say is Graham's history of corruption. Mill's attorney has accused Graham of lying under oath during his original trial. Despite the striking win for the rapper and his legal team, Meek's judge on the case remains Genece Brinkley of the state's Common Pleas Court, who first ruled that Meek return to prison over parole violations that have since been dismissed. Brinkley has maintained that the sentence was not excessive. Per the court docket, Brinkley now has 60 days to address the defense team's post-conviction relief motion, which will hinge on whether Graham's testimony should be thrown out, and whether that testimony was central enough to Mill's conviction to warrant a new trial. If so, the prosecution can elect to drop its case. That hearing is scheduled for June 18. Meek's case has drawn nationwide attention and has been characterized as typifying the mistreatment of black men by the country's justice system. Names ranging from Jay-Z and Beyonce to Pennsylvania Governor Tom Wolf to the Philadelphia Eagles have voiced support for the 30-year-old rapper's release. "Meek is excited to be reunited with his family, and we, along with Meek, intend to continue to shine the light on a justice system in need of reform to prevent any other citizen from being put through what Meek has endured." Joe Tacopina, one of Meek's lawyers, tells NPR Music in a statement. After the Supreme Court's ruling, Philadelphia 76ers co-owner Michael Rubin shared on Instagram that he was on his way to Chester State Prison to pick Meek up. As the news of the impending release was made public, the rapper tweeted a statement to his fans. "To the Philly District Attorney's office, I'm grateful for your commitment to justice. I understand that many people of color across the country don't have that luxury and I plan to use my platform to shine a light on those issues," Meek shared. "I plan to work closely with my legal team to overturn this unwarranted conviction and look forward to reuniting with my family and resuming my music career."